Are you ready to go Jason on some Undeads? 24 inches of unstoppable steel could be all that separates you from infected teeth. 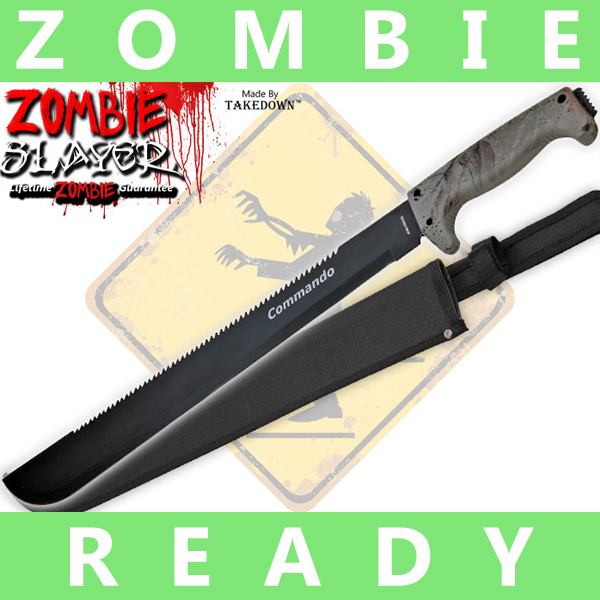 Whether it's a biological infection or paranormal pandemonium, this 440 carbon steel machete has your back. And your front. With the Undead everywhere it's easy to become unhinged; we made this machete's blade full tang so you never lose your grip. A super sharp 18 inch blade just isn't enough, is it? We decided to cut a saw into the back of the blade for good measure. Campfires are going to be a daily occurrence for cooking, and keeping yourself warm; make quick work of any low hanging branches, and cut what you have to make it last. Not done yet. The bottom of the shaft also serves as a window breaker. Finding car keys won't be very easy during the apocalypse, and you wouldn't want to mess up your blade on a car window. When you're done, rest it in the included sheath. Fits right through your belt loop so your machete is always ready when you need it again. Which will be soon.